Students in the Honors College had an opportunity to explore Vanguard, one of the world’s largest investment companies with more than 17,000 employees worldwide. 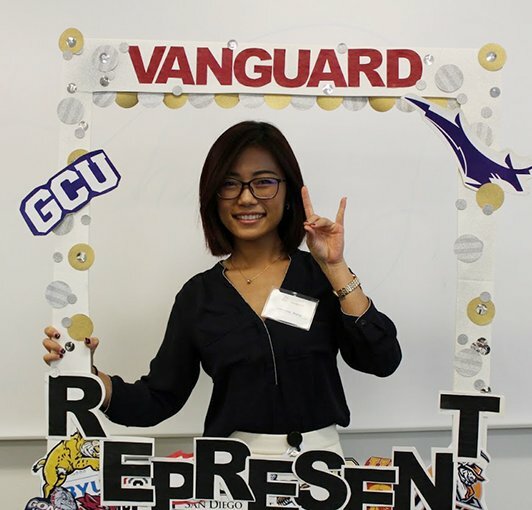 When Catherine Xiong, a Colangelo Scholar leader at Grand Canyon University, first heard about a full-day opportunity to explore Vanguard, one of the world’s largest investment companies, she knew she had to take a chance for her peers. Student Catherine Xiong was excited to be able to learn about Vanguard along with her peers. Almost immediately, Xiong got to work with the Career IMPACT Center and Honors College program managers Aysha Bell and Luke Amargo to plan, coordinate and host a five-hour “College to Corporate Workshop” at the 500,000-square-foot campus in Scottsdale. Nearly 36 Colangelo Scholars and Honors students took part in Vanguard Explore Day. 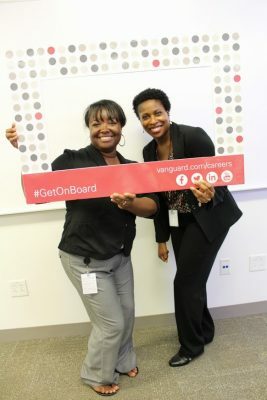 There, they met and networked with Vanguard leaders, GCU alumni who have been hired by Vanguard, and professionals who helped them envision careers and opportunities post-graduation. Investment-management companies such as Vanguard value, recognize and want more students with Xiong’s ambition and talent to contribute to the global industry leader, Bell said. Bell, who led the group of students to the campus, said Vanguard was extremely impressed with the caliber of students at GCU. “Our students looked so professional, they were extremely prepared and Vanguard had that exact same takeaway,” she said. Business management major Riley Harshbarger was most impressed with the firm’s inclusive culture – which promotes career growth. Aysha Bell (left) could not have been more pleased with the students’ experience at Vanguard. Xiong was happy to see how active and engaged her peers were while they toured the facility. Angela Bratt felt the same way. “GCU students came with lots of questions, which in some cases seemed to have an impact on Vanguard employees,” she said. Bratt, who is already working to submit an application for an internship this summer, said the experience made her feel appreciative of Vanguard. “I’m excited and support what Vanguard does,” she said.